This book should be of interest to scholars, researchers, students, and practitioners alike. Scholars, researchers, and students of personal relationship development will recognize in this book the first serious attempt in over 40 years to do a large-scale, longitudinal study of premarital factors that predict premarital breakup and marital quality; they should also appreciate our attempt to develop a theoretical rationale for predicted paths and to test those paths with the best available statistical tools. Practitioners-while generally not as interested in the intricacies of the statistical results-will find much that is useful to them as they help individuals and couples make decisions about their intimate relationships, their readiness for marriage, and how to increase the probability for marital success. Teachers, family life educators, premarital counselors, and clergy will find helpful our "principles for practice," particularly as described in Chapter 9, as they teach and counsel couples in any premarital situation. My interest in the development of relationships from premarital to marital probably began when I got married in 1972 and started to notice all of the characteristics my wife and I brought from our respective families and how our "new beginning" as a married couple was in many ways the continuation of our premarital relationship, only more refined and more intense. 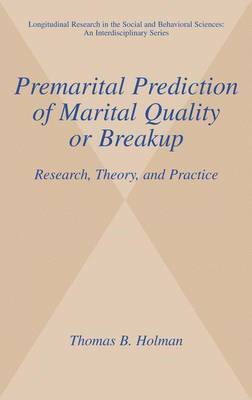 My professional interest began when I did my doctoral dissertation in 198 1 on premarital predictors of early marital satisfaction (the results of that study are reported in Chapter 8).